The Vancouver Whitecaps' road to the playoffs is clear: Win their remaining three games and they're in. That road, however, won't be an easy one. All three teams remaining on the Whitecaps' regular-season schedule -- including Sporting Kansas City, which visits BC Place on Wednesday -- sits above them in the Western Conference standings. SKC (15-8-8, 53 points), which sits in third place, and second-place Los Angeles FC (16-8-8, 56 points), Vancouver's Saturday host, have both clinched playoff spots. The Whitecaps (12-12-7, 43 points) wrap up the regular season at home against the fourth-place Portland Timbers (14-9-9, 51 points). The Timbers, sixth-place Real Salt Lake (46 points) and the seventh-place L.A. Galaxy (45) all have just two games remaining. The Timbers and RSL square off on Sunday. Kansas City has stumbled a bit down the stretch, going 0-1-2 in the past three games, but the Whitecaps enter Wednesday's contest without six key contributors -- including Canadians Alphonso Davies, Costa Rican center back Kendall Waston, and Peruvian forward Yordy Reyna -- who are away on international duty. LAFC has lost just once in its past eight games and is 9-1-6 at home, while up-and-down Portland played Dallas to a 0-0 draw and had a vital 4-1 win over Salt Lake in its most recent outings. 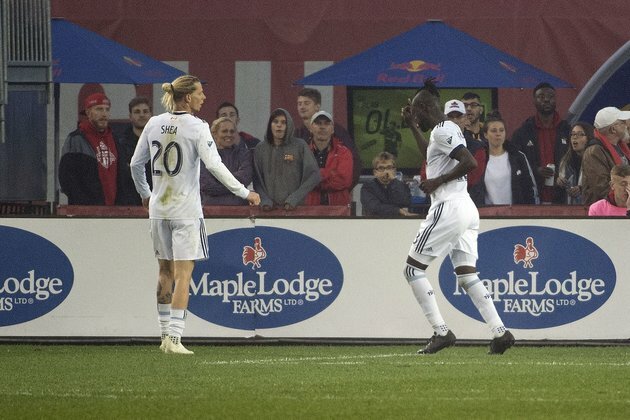 Vancouver will look to carry the momentum of its 2-1 win in Toronto in its first game under interim head coach Craig Dalrymple, who replaced the fired Carl Robinson. "We have a little bit of an identity now, and I think we'll continue to improve it," Dalrymple told the Vancouver Sun. "There's areas that we aren't happy with that we will improve. "We sagged a little bit too much midway through the first half and into the second half, and we need to get a little bit higher up the field. "We addressed that in video ... and we'll correct that going into the Kansas City game. We hope we can continue to be aggressive and impose ourselves." The Whitecaps won't be doomed by a loss or draw on Wednesday, but they'll no longer control their own destiny. A Sporting win on Wednesday would put Kansas City in second place, thanks to goal differential (SKC leads LAFC by one entering the match). That result would set up a showdown for first in the West on Sunday in Dallas. "It's really important when you get down to the end of the season that you're in good form, not bad form. It's important as we keep vying for a playoff position and trying to accumulate points that we are playing well," Sporting KC coach Peter Vermes said. "Right now, I feel comfortable with the fact that we're playing well and creating good chances. If we knock out a few of those chances and we're in a much different place in this game." The No. 1 seed in the West could be on the line when SKC hosts LAFC in the season finale Oct. 28.